Canton, 55 @ Attleboro, 64 – Final – In a back and forth close matchup, Jake Dunkley and Attleboro pulled away in the fourth quarter. Dunkley finished with 20 points while classmate Berlyns Abraham had 15 points and 10 rebounds. Nate Douglas added 12 points for the Bombardiers. Canton sophomore Devin Foster had a career-high 21 points while Tony Harris added 12 points and five rebounds and Jake Verille added eight points and three rebounds. Foxboro, 36 @ Mansfield, 66 – Final – Mansfield limited Foxboro to just 14 second half points, turning a two point lead at the end of the first quarter into a 15-point lead at halftime and a 27 point lead at the end of three. John McCoy, Max Boen and Sam Goldberg (six rebounds) each scored 11 points apiece to lead the Hornets. Andrew Block had 11 points and seven rebounds for Foxboro. North Attleboro, 51 @ Franklin, 72 – Final – Click here for a recap of the game. Milford, 60 @ King Philip, 50 – Final – Between the end of the first quarter and beginning of the second quarter, Milford rattled off a 19-2 run that created a cushion they held for the rest of the way. With KP up 10-2, the Scarlet Hawks flipped the game with the run. Senior Anthony Arcudi netted a game-high 17 points, Shane Cosquete added 10 points, both Zach Tamagni and Nate Davila scored nine points and junior Kayden Kelley hauled in 15 rebounds to go with four rebounds. Justin Vine and Tom Madden each scored 12 points apiece while Pharaoh Davis came off the bench to score 10 points for the Warriors. Stoughton, 47 @ Oliver Ames, 55 – Final – After being tied after the opening quarter, Oliver Ames opened a three point lead by halftime, a four point lead after three quarters and then held that lead in the fourth quarter. Three Tigers scored in double digits, led by Dylan Mahoney’s 21 points. Junior Jack Spillane added a career-best 16 points and Carter Evin chipped in with 10 points. Stoughton senior Cam Gomes dropped a career-high 19 points to go with seven rebounds. Sharon, 51 @ Taunton, 65 – Final – Sharon was able to hang around through three quarters but Taunton pulled ahead in the final quarter. Freshman Dante Law scored a career-high 18 points to pace the Tigers with senior Tommy MacLean adding 13 points. Jimmy Fitzhenry led Sharon with 16 points while senior Ricardo Ripley chipped in with 12 points. Mansfield, 45 @ Foxboro, 25 – Final – Click here for a recap of the game. Franklin, 36 @ North Attleboro, 43 – Final – The Rocketeers outscored Franklin 19-12 in the fourth quarter to pull out the win in their season opener. Ashley Ahern led the way for North with 15 points, including eight in the fourth, and sophomore Julia Feid had 10 for the Rocketeers. Franklin was led by freshman Ali Brigham who scored 18 points in her second varsity game. King Philip, 47 @ Milford, 44 – Final – The Warriors rallied from seven points down in the fourth quarter to pull out the win in their season opener. Sophomore Shannon O’Connor was the top scorer for KP with 12 points and freshman Faith Roy chipped in with nine. Junior Hadley Zolak had six points for KP, including important baskets down the stretch. Milford was led by Kate Irwin’s 17 points. Oliver Ames, 51 @ Stoughton, 32 – Final – OA was led by three players with 11 points apiece – senior Niyera Mitchell, junior Kayla Raymond, and freshman Meg Holleran. Taunton, 29 @ Sharon, 46 – Final – Sharon jumped out to an early lead and never let up. Sophomore Emma Eberhardt was the top scorer for the Eagles with 18 points and added eight rebounds and six steals. Shira Stoller added six points, eight rebounds, and nine assists for Sharon. Mansfield, 3 @ Norwood, 3 – Final – Chad Piotti scored a pair of goals, including the game-tying goal in the third period, to earn Mansfield a point in the opener. Joey Olsen added the other goal for the Hornets. Attleboro, 42 @ North Attleboro, 43 – Final – Brent Doherty was the top scorer for North Attleboro with 20 points. Chad Peterson chipped in with eight points and Ridge Olsen had seven, inlcuding a three-pointer in the final two minutes that turned out to be the game-winner. Attleboro was led by Jake Dunkley with 18 points, including seven in the fourth quarter, and Nate Douglas added eight points and nine rebounds. Canton, 50 @ Stoughton, 63 – Final – Stoughton sophomore Cam Andrews scored a career-high 24 points to pace the Black Knights while senior Brandon Teixeira had a double-double with 18 points and 18 rebounds. Canton’s Tony Harris scored a team-high 15 points for the Bulldogs. Foxboro, 64 @ Milford, 44 – Final – Foxboro senior Rob Lowey had his best scoring night of the season, dropping 20 points to lead the Warriors. Alex DuBrow added 15 points in the win. Dimitry Torres led Milford with 15 points while Zach Tamagni had 12 points and Dwight Anderson had 11 points. Franklin, 67 @ King Philip, 41 – Final – Franklin senior Tim Prunier scored a game-high 14 points while sophomore Paul Mahon had 12 points. King Philip’s Justin Vine had 11 points and junior Noah Goodwin delivered nine points. Sharon, 60 @ Oliver Ames, 51 – Final – It was a balanced offensive attack for Sharon with Ricardo Ripley and Tyler Smith each scoring 12 points and grabbing a pair of rebounds. Senior Andrew Filipkowski scored 11 points off the bench and junior Peter Banks had six points to go along with 10 rebounds. OA’s Tim Kelley scored a game-high 14 points while Dylan Mahoney and Mike Graziano each scored 10 points. Taunton, 61 @ Mansfield, 47 – Final – Taunton’s Jose Mercado had a big night, leading the Tigers with 19 points while hauling in 14 rebounds. Tommy MacLean added 15 points and Carlos Borrero had 14 points for Taunton. Mansfield’s Sam Goldberg scored a game-best 21 points and pulled down nine rebounds for the Hornets. Canton, 40 @ Stoughton, 41 – Final – Sophomore Jordan Motley dropped a career-best 13 points and grabbed 10 rebounds to record a double-double in the Black Knights’ win. Val Whalen, another sophomore had seven points and 14 rebounds. Foxboro, 66 @ Milford, 55 – Final – Ashley Sampson scored a game-high 18 points to lead the Warriors while Cassidy Harrison paced Foxboro early, finishing with 14 points. Milford’s Jill Powers had 15 points and six rebounds while Nicole Dahlgren had 10 points and five rebounds. 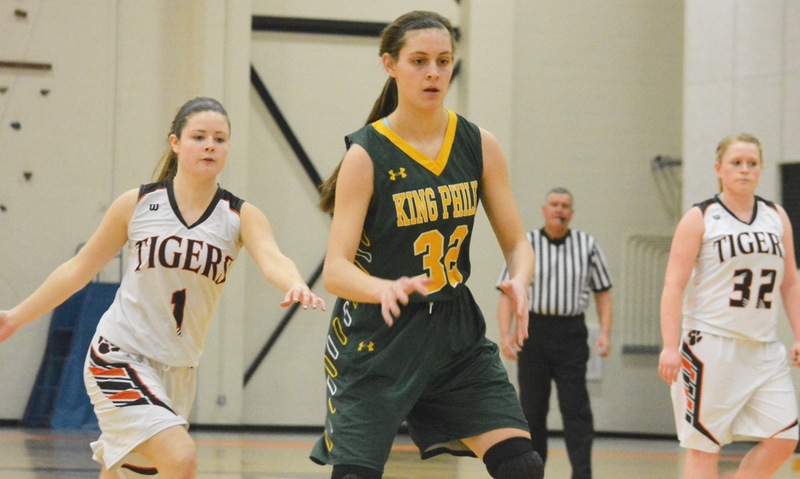 Franklin, 64 @ King Philip, 44 – Final – Franklin’s Olivia Adiletto scored a game-high 20 points while Aubrie Kutil registered a double-double with 15 points and 13 rebounds to lead the Panthers. Maddie Purdue had 13 points, Sam Madden had 11 points and Hadley Zolak and Julia Leroux each had six points for KP. 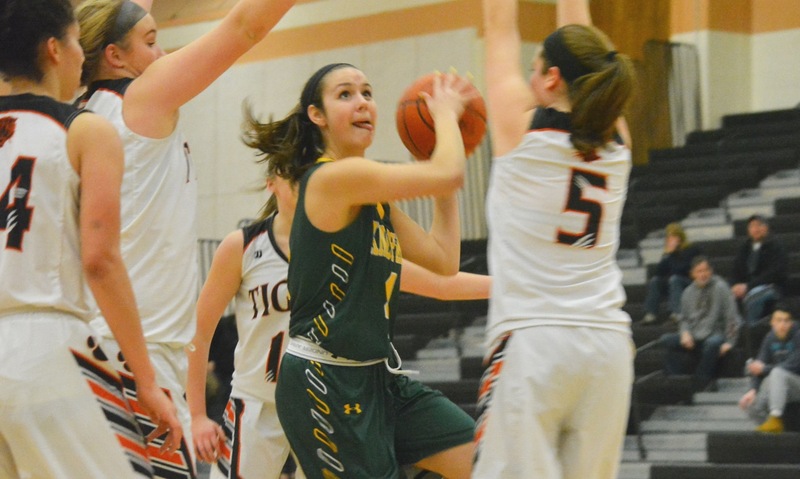 Taunton, 32 @ Mansfield, 59 – Final – Meg Hill scored 10 points and added nine rebounds and six blocks for the Hornets. Lindsay Dalton added a career-high seven points for Mansfield. Taunton was led by Hannah Moniz with eight points. Attleboro, 51 @ North Attleboro, 43 – Final – Attleboro had three players earn double-doubles. Sam Pierce scored 15 and had 12 rebounds, Emily Houle had 13 points and 11 boards, and Sarah Deyo had 13 and 10, despite missing all but 1:17 of the second half. North Attleboro was led by Emily Schromm and Samantha Taggart, who each scored nine points. Sharon, 30 @ Oliver Ames, 62 – Final – Oliver Ames junior Niyera Mitchell had a career day, scoring 16 points and pulling down 13 rebounds in the big win. Kaitlyn McCarthy added 14 points for OA and Francesca Calabraro had 11 points. Alyssa Piazza led Sharon with 12 points.